I'm about to take you for a ride on the Dummy Railroad, but before we go, I need to share some facts about it with you. Now, you are probably wondering if the Dummy Railroad was some sort of miniature rail line run by Edgar Bergen, Paul Winchell, Jeff Dunham, or the Muppets.So, let's go back in time for a moment and reminisce about the origins of the Dummy Railroad. The truth is, from 1880 until 1923, the Dummy Railroad was a two-track, standard-gauge(four feet, eight and one-half inches) 3.24 miles-long rail line running from Old Orchard Beach, Maine to Camp Ellis (Saco, Maine), where passengers could make connection with a small ferry to cross the Saco River to Biddeford. With Old Orchard Beach becoming a major summertime tourist attraction in the last quarter of the nineteenth century, some visionary businessmen foresaw the value of a coastal rail line along the eastern Maine shore. Thus, a railroad was chartered by a special act of the Maine Legislature to the Old Orchard Beach Transportation Company as the "Old Orchard Beach Railroad Company" on February 7, 1876. The original incorporators were James T. Furber (for whom Furber Park in Ocean Park is named), M. G. Palmer, Joseph Hobson, T. K. Lane, James H. Andrews, George F. Calef, and John Lane. This group contracted the services of J. M. Robbins Company of Lewiston, ME to build the line, which saw its first service on June 26, 1880. Financial analysis showed that construction costs came to $19,305.94, while equipment costs (four cars: $4,750.50; two locomotives: $5,887.12) came to $10,637.12. The total cost came to $29,943.06. The line was eventually leased to the Boston and Maine Railroad from 1883 to 1893, when it merged with the Boston and Maine Railroad, becoming known as the "Old Orchard Beach Branch." How the line got its currently out-of-favor nickname is one of conjecture. The term "dummy railroad" may have had its connotation from the fact that the original engines, #86 (originally called Grant #1185) and #87, which pulled or pushed the trains were smaller, produced less steam and smoke, and were extremely quiet relative to other types of locomotives. In fact, one report about the use of fuel by two locomotives combined shows that forty-two tons of coke were burned over the course of one summer, equal to about fourteen pounds of coke burned per mile traveled. The diminutive engines' size led some wags to call them a "teakettle." A second, more pejorative connotation, implied that the original 0-4-0T locomotives were not smart enough to turn around at the end points of the line in Old Orchard Beach and Saco. In actuality, the line had no turn-table capabilities, so the engines pulled their trains of two or three cars forward 3.24 miles to Camp Ellis from Old Orchard Beach, while backing and pushing the same cars on the return trip to Old Orchard Beach. 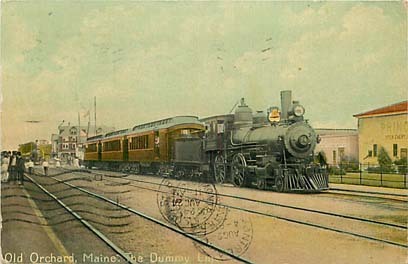 Eventually, the two smaller-sized engines were replaced by standard sized locomotives and larger passenger cars, but the nickname "Dummy Railroad" stuck until the line's demise in 1923. Whether the locomotives could turn or not turn seemed to be of little matter to the passengers, as the line carried about fifty thousand passengers during its first twelve years. Convenience was a hallmark of the line, as a passenger could travel on the line from 6:00 a.m. to 10:30 p.m. on any given day. The first daily trip left Camp Ellis at 6:00 a.m., while the last trip out of Old Orchard departed at 10:30 p.m. Riding the rails in one of the cars was just plain fun, without the amenities expected today. The original, smaller-sized passenger cars were just plain, with cane seats holding two passengers apiece across a center aisle; no drinking water, and no toilets. They were clearly intended for summer use only as there was no heat. Oil lamps provided illumination. In case of cool breezes or rainy conditions, each car had shades which could be dropped down to protect passengers from the elements. Starting our ride to Camp Ellis on the Dummy Railroad, we'll board one of twenty-three daily trips at the "Camp Ground Depot" stop by Union Avenue, Old Orchard Beach. Oh, as we get started, a warning! The engine has been known to derail, so some of you men may be asked to get off your cars and help get it back onto its rails. We'll run parallel to Boston and Maine tracks for a while, then branch off to head to Ocean Park. We'll cross West Grand Avenue by the Robinson Memorial Building, run parallel to Seaside Avenue to about Tunis Avenue, stopping next at Baty's Cottage, Oceana Avenue (fare to Oceana, Ocean Park (aka "Demeritt's Square"): five cents), cross Goose Fare Creek which separates Old Orchard Beach from Saco, Kinney Shores Brook (where there was a siding which allowed the trains to safely pass each other), Bay View House, Ferry Beach State Park, Grovemere, and Camp Ellis. All for a mere ten cents! The return trip will cost us five cents if we get off at Grovemere or Ferry Beach State Beach Park. The whole trip should take about twenty to thirty minutes, unless someone waves us down, in which case the engineer will stop the train to pick up that person, or if one of the train crew decides to grab a quick cup of coffee or some other refreshments offered by the owner of a trackside cottage. We may even be stopping to help a cottage owner with a household chore. Should you wish to get off anywhere along the way because you are going to be staying at one of the seaside resort hotels, just signal the conductor. He'll stop the train and even get a couple of men to help you tote your luggage (or even your newly-caught fish)from the baggage car in the front of the train. Before I forget, we might have to slow down or stop entirely on the Goose Fare Brook trestle because some naughty boys might be playing daredevil on the tracks or hanging off the wooden ties anchoring the rails! Here we are at the end of the line in Camp Ellis. Perhaps you'll want to take the short walk down the pier to get on the waiting Piper ferry "S. E. Spring," cross the mouth of the Saco River, and take a pleasant cruise to Biddeford Pool or Wood Island. The train ride and the cruise will set you back a whole forty-five cents! Thanks for riding with us! While the fares may seem paltry by today's economic standards, one estimate holds that the net profit for one season of the Dummy Railroad came to about $2500, or about one-half cent per paying passenger. As with many good things, the Dummy Railroad did not last forever. With the advent of automotive travel on ever-improving roads, more automobiles began to appear at resort areas, taking passenger business away from rail travel. Sadly, the "Dummy Railroad" unofficially ended its existence when it ceased operations on September 23, 1923. The official end came July 23, 1924 when the owners' application with the Interstate Commerce Commission in Washington, D.C. to abandon the rail line was approved. The only remaining visible artifacts of the Dummy Railroad are the few trestle pilings remaining from the Goose Fare Brook trestle, generally visible only at low tide. Thank you to Old Orchard Beach Town Historian Dan Blaney for providing editorial suggestions and encouragement for this article. The Old Orchard Historical Society, founded in 1954, provided many background resources resources for this article. It cordially invites you to visit its home, the Harmon Museum to learn more about our history - its famous people, places, and events. This beige-colored house, located at 4 Portland Avenue in Old Orchard Beach, was donated to the Town of Old Orchard Beach and the Old Orchard Beach Historical Society in 1974 by the will and generosity of its owner and prominent citizen W. Warren Harmon, a charter member of the Old Orchard Beach Historical Society. This article original published by OOB365.